The Secret Is Out! | Kid Reporters' Notebook | Scholastic Inc.
“A star is born,” said Soman Chainani, author of The School for Good and Evil, a best-selling The New York Times book series. Chainani was speaking at the launch for The Serpent’s Secret (Scholastic, 2018), a middle-grade novel written by my mother, Sayantani DasGupta. A humorous and fast-paced fantasy, The Serpent’s Secret is the first in a planned series called Kiranmala and the Kingdom Beyond. It is based on the traditional Bengali folktales and children’s stories that DasGupta heard from her grandmother as a child. The narrator of the story is a 12-year-old girl named Kiranmala, who lives in New Jersey. On the surface, she seems like an ordinary sixth-grader. But this daughter of immigrants from India struggles with her identity. The launch for the novel took place last month at Books of Wonder in New York City. 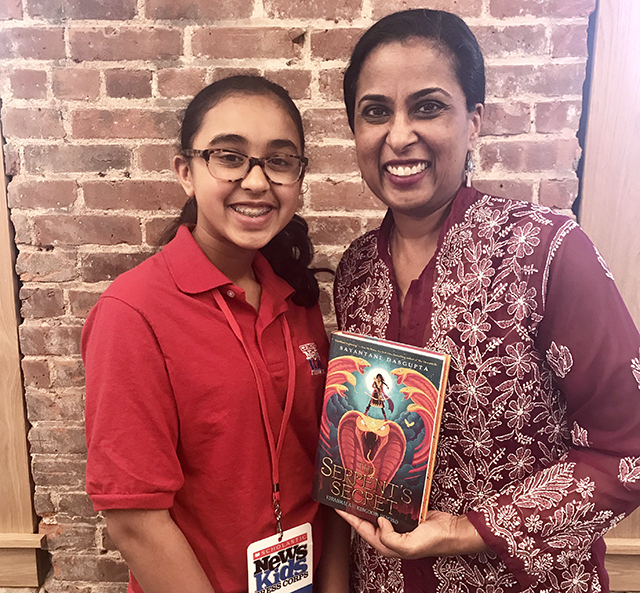 DasGupta told assembled readers, authors, and friends about the inspiration for the book and its heroine, whose parents tell her that she is “a real Indian princess” from a different dimension. Kiranmala refuses to believe them at first, but a series of extraordinary events helps her to understand their wisdom. DasGupta, who is a pediatrician by training and a professor of Narrative Medicine at Columbia University, is now anticipating publication of the second novel in her series, which is due out in early 2019. She noted that The Serpent’s Secret, like the recent films Black Panther and A Wrinkle in Time, shows young people that heroes can be any gender or color.